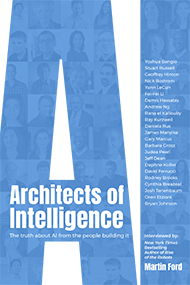 The Economist has a column on artificial intelligence and the Luddite fallacy that mentions “The Lights in the Tunnel.” Paul Krugman comments briefly. 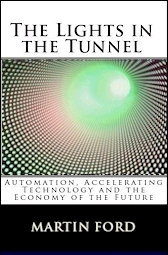 Ford’s basic thesis (laid out in his book “The Lights in the Tunnel”) is that machines are now getting so advanced that they’re going to be better than human beings at doing everything and thus there will be no jobs. He also thinks this is a very bad thing, a view which I think is terribly strange. In fact, I’ve never said there will be “no jobs.” I’ve only said that technology may ultimately eliminate the bulk of routine jobs. But that will nonetheless result in major problems. History suggests that the 25% unemployment the United States experienced during the Great Depression is probably pretty close to the limit of what a democratic society can withstand. I also have never said that advancing technology, or job automation, is “a bad thing.” In fact, I agree that it is a great thing. I just believe we need to reform our economic system so it will be a great thing for everyone — and not just a tiny elite. Suggesting such reforms was really the whole point of my book, “The Lights in the Tunnel.” We cannot escape the fact that a great many people are best equipped to do routine things and will have great difficulty moving to non-routine/creative areas, even if those jobs are available. If we assume a bell curve distribution, then by definition, 50% of the workforce is average or below average in terms of capability. At the same time, technology is also encroaching on even the high skill jobs held by people with above average capability. Ultimately these trends will demand a response. Machines are about to get so good that humans just won’t have anything to do at all. We won’t need to sow, weed or reap, sew or in fact anything. Not only will food and clothes be made by machine, the machines that make the machines that make the food and clothes (and houses and cars and computer games and….) will be made by machines. Humans will therefore have no jobs, no jobs at all. Ford thinks this is appalling as therefore human beings will have no incomes. I think it sounds like a rather wondrous world actually, even without humans having any incomes. The problem is that in the world as it exists today, you do not get to consume without an income. I think Tim is saying that all those machines will make production so efficient — and prices so low — that even people with very low incomes will still be able to consume. There are a couple of problems here. First if your income is ZERO, then it doesn’t matter how low prices are: you are out of luck. And a great many people will be in that situation unless we dramatically improve our social safety net. The second issue is that efficient machines will not drive down many of the fixed costs that take up most household budgets. Powerful robots are not going to lower the principal on your mortgage. Nor are they likely to drive down food prices much, as agriculture is already highly mechanized. We can dream that technology will dramatically lower health care costs, and maybe it will happen someday — but probably not until after you lose your job. In general, if prices fall in one area — say food production or computers — that has historically been a good thing. But if wages and prices fall across the board then that is DEFLATION. And a big problem with deflation is that while wages, prices and asset values may fall — debts do not. In time, people will default or debt service will leave them with little discretionary income to spend on other things — creating the risk of a deflationary spiral. I’ve written more about this in a previous post. Marshall Brain has started posting new items to his Robotic Nation Evidence Blog. Supply Chain Digest: Automation In The Workplace Is Inevitable – The Question Is: Are We Smart Enough To Plan For It? CBS MoneyWatch: Is Silicon Valley fueling unemployment? There was a huge debate on slashdot.org about this where you were cited many times. A lot of people thought it was wonderous the new tech age. Where a loaf of bread could be sold for 10cents. Except without an income 10cents would be too high or if so the loaves of bread could be free. Except this posed another problem. Why would capital owners/ Robot owners be spending money on baking free loaves of bread? One joke (I hope) line of thought in that thread was that things will continue as they are and the jobs market will shrink causing an M shaped society. Such automation and robots will be employed as security for the capital and robot owners instead of producing things cheaply. It makes sense as robots are getting more efficient than humans and I suppose this can be applied to war. That robots will be able to suppress people more effectively and it does not have the problem of soldiers defecting against you. Martin, Glad to see you’re keeping up the drumbeat on all this. On Ken’s point on an M shaped society, it seems to me that, as two extremes, we could either have a society where the fruits of industry are broadly shared with everyone alive now (like with a basic income, funded by taxes or however), or we will see the extermination (through starvation or war) of the masses of humanity and then the small remainder of humanity (capital owners) then will have broadly share prosperity through the fruits of capital ownership. There may be other possibilities, but those are the two extremes that include humanity surviving at all. I agree with you that monetary shifts can be problematical (whether inflation or deflation). Inflation tends to be better between the two, because it is sort of a tax on those hoarding cash and also reduces debt burdens (although it is tough on those with fixed incomes like pensions not tied to inflation). “In addition to farm prices there are other significant components of food prices. Food prices factors, according to the U.S. Bureau of Labor Statistics Consumer Price Index, are: 44 percent fuel, transportation and energy, 29 percent raw farm products,19 percent labor costs, 8 percent other expenses. But, the bigger issue is that we can reduce those other non-labor costs through automation or better design (from smarter tools and networks). For example, what happens to transportation costs when all long distance trucking is done by robots? What happens to energy costs when AI-based tools help us design cheaper solar panels or help us create breakthroughs in fusion energy (hot or cold)? What happens when the knowledge continues to spread through the internet that an easy way to make great fertilizer is just to grind up rock? So, robotics, AI, and the internet may reduce all those non-land costs significantly. And the only main actual cost to farm land is just paying rent (or interest on a mortgage) to those who, for whatever historical reason, claim to be owners of it (based on either “finder/keepers”, “might-makes-right”, or some paper trail of sales connected to one or the other of those). Meaning, we can question at the governmental level how exactly rents for land should be set if that is the only thing between people and abundance (the government in the USA also owns a lot of land still, anyway, and as above we could grow a lot of food on a little land through indoor agriculture). Homes may become more space-ship self-reliant like in that sense for people who want to live that way (many may not want to). Also, better social networking helps more and more people realize they can save on groceries during the summer and health care costs by eating more in-season vegetables and less meat. So, there are lots of ways food costs may go down as robotics, AI, better design, and voluntary social networks spread, and also as we just accumulate more infrastructure over time as a society. However, with all that said, I still think Martin has a point. Even when food is vastly deflated in cost, if you have zero income, you will still starve. So, we need some other change, or mix of changes, like a basic income (essentially Martin’s suggestion) or a stronger gift economy, or participatory government planning, and/or access to enough land for subsistence production. I think we will probably see a mix of all those solutions. I’ve been thinking about this issue recently and I’m wondering what kinda of strategy could be employed to transition to a society based labor for wages doing routine work to income based on capital ownership and non-routine creative work. As Martin has pointed out jobs in manufacturing as increasing being automated and now white collar and service work is being targeted. However, I don’t believe that infrastructure/construction work is anywhere near being automated. Now I believe it is ultimately possible to automate construction so while we could shift from service economy to an large Infrastructure economy must like we did in the Great Depression such a economy would a short reprieve (maybe about 50 years). I can’t think of any other major economy outside of infrastructure and healthcare which have as long grace period. But the question remains what will we do after we have robot piper fitters, heavy machine operators, roofers, and electricians? Before then we need to transition to an economy based idea of getting value out of personal relationships and non-routine qualities of human creativity. Unfortunately, the idea of turning construction workers into artists, educators, and customizers seems rather hard. 2. Create a “education for all” program which aims at training people for producing customized designs, media production and performance art, designing for space human space colonization. 3. As we shift the economy to personalization and customization we create worker owner co-opt so that whatever wealth owned by a private firm is distributed widely regardless of level automation. In effect, the worker-owner co-opt model create a dividend system which would function as a private basic income guarantee system without the need for a large centralized government run system. Does anyone have better ideas for transitioning.wages for routine work to a economy of shared ownership and creative discovery? @Septeus7 — While I like your proposals, especially about space colonization (I’m a big fan of space habitats), I feel something like Martin proposes, essentially a basic income, would help a lot in the short term. I feel that would be a better option than to create “make work” jobs just for the sake of paying people or expanding Prussian-derived public schooling (which itself was designed to dumb people down to make them into compliant factory workers and meet the needs of the 1800s Prussian military). We could just end age discrimination for Social Security and Medicare so that it is available to all citizens from birth. Then people could make their own choices about how to spend their time, and I hope we would see a resurgence of community life and family life, as well as a lot of other creativity (pipe fitters might decide to become metal sculptors, heavy machine operators might decide to teleoperate robots to clean up radiation from Fukushima across Japan as volunteers, and so on). There are other ideas which can go along with a basic income (improved subsistence by 3D printing and solar panels which is connects to your “worker/owner” model, an improved gift economy like through the internet, and better participatory democratic resource-based planning). I discuss that in more detail on my website. I believe the solution to transitioning is in a Direct Technocracy. Something like what’s described in the 2008 novel “Forever Pleasure: A Utopian Novel”. But do we have the technology yet? Some of the question of whether automation is taking away jobs reminds me of the global warming debate. Skeptics point to the fact that temperatures in the past have risen and fallen and the animals have always adapted, while others have said that this fails to take into account the suddenness of the change. Martin, I was pleasantly surprised when I saw The Economist quoting you! Do you think this discussion is becoming more mainstream? Yesterday I was interviewing a professor from a British university and he was telling me how they’re doing some research to automate teaching. They’re already delivering some lectures through e-learning, and are looking into automating some part of it. This guy loved the technology, but stated that he doesn’t feel threatened at all by this, that his character as a human person is irreplaceable and thus he’ll be working together with the robot, I guess like it’s described in the book ‘Race against the machine’. If many people are unemployed, where will business get the capital to run their companies that robots/technology do instead of humans? To me the answer is obvious, you cannot sell to a nation of paupers and if you cannot sell then you go out of business. If somehow tomorrow a robot is built that takes away many low skilled jobs and uneployment goes to 30%, I would say that the capitalist system will collapse. Maybe robots and technology will be banned or curtailed when the negatives outweigh the disadvantages, but not until after a lot of pain has been caused. When you have people with income they spend money and business prosper. So a business that goes full automation hoping to make more stuff, will soon find out that there will not be more people to buy their stuff like before. I’m very happy to find this site. I need to to thank you for this particularly wonderful read!! I definitely liked every bit of it and i also have you saved to fav to see new things in your website.